A new year gives you time to regain control of your life, and plan for a whole year of success. This is the best time to reset the controls and take some real action. But often, what stops us from reaching our goals is the lack of continued motivation and guidance to continue on this path throughout the year. The most challenging task is to stay the course month after month. Here are some steps and tools to help you plan for your success in 2017. Step 7: Take collective stock of the entire year. All of these steps combined will create your winning streak in 2017. They will keep you on your path to success, and each small win will add to your achievements one after another. All of the above can be achieved easily and can be taken care of by using a success tool. This tool comes in the form of a success oriented personal planner. You can get your very own success planner for 2017 to kickstart a grand year ahead. Kick Start Your 2017 and make it your year of Success. This planner has been designed to set you rolling on your path to success & prosperity. It addresses your need for a desire, more clarity, a systematic plan of action, a progress-check personal scorecard, the results & learnings, all of it, for each of the 12 months of the Year 2017. It is presented in an easy-to-follow, fill-in-the-blank style that is super effective and convenient to use. 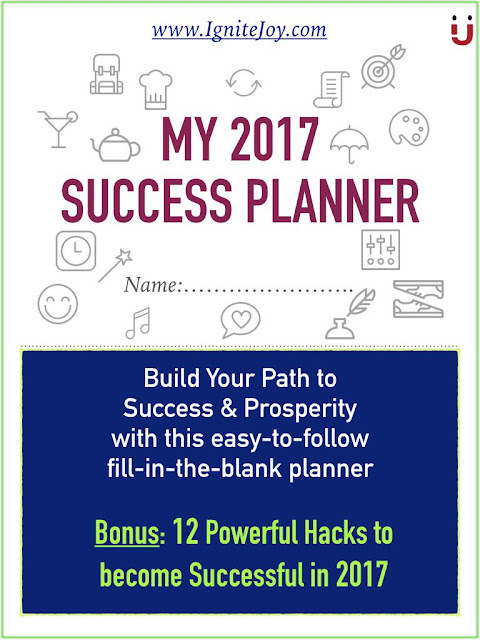 BONUS: 12 Powerful Success Hacks are provided to you in this planner to boost your efforts for Success. These Hacks will help you get streamlined and focus and derive maximum benefit from all your work. They will improve your efficiency and help you approach your goals more optimistically. Available in Kindle edition and Paperback edition.